The Seattle Seahawks have become perennial contenders in recent years. The Kansas City Chiefs have been playoff contenders, but have failed to turn the corner and become a legitimate Super Bowl threat. Playing each other can be a great way for each to gauge where the team is at—yes, even in the preseason. From how both looked Friday night, it appears as if both are going to be just what they have been for the last few years. Seattle has an excellent chance of being one of the last two teams standing. Kansas City should be good, but the Chiefs are far from being a contender. Even though the first team guys saw a fair amount of action, any and all observations have to be taken with a grain of salt. It is still just a preseason game, but that doesn’t mean there were not things worth taking notice of. 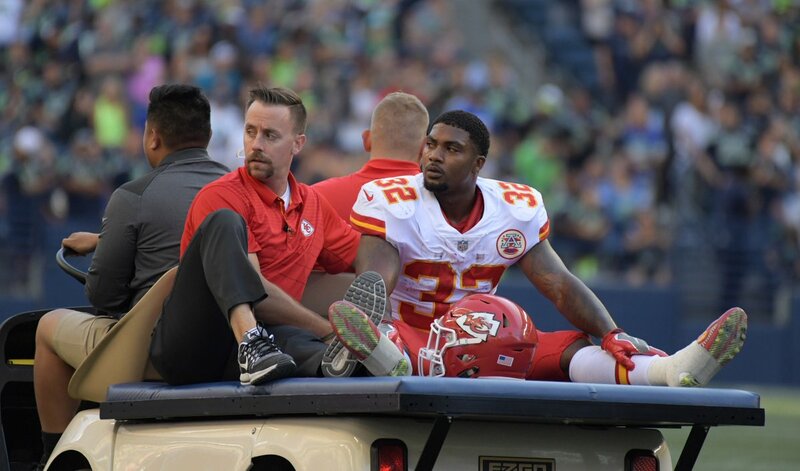 Spencer Ware went down early with an apparent knee injury. So far, the word is he has a PCL injury but the team planned on having him get an MRI done Saturday morning to make sure the ACL was okay. Ware’s injury could mean little in the long run. Rookie Kareem Hunt has looked great in camp and preseason action. Rumor has it he could be taking over the No. 1 spot. He did look good against a tough Seattle defense (nine carries, 39 yards). 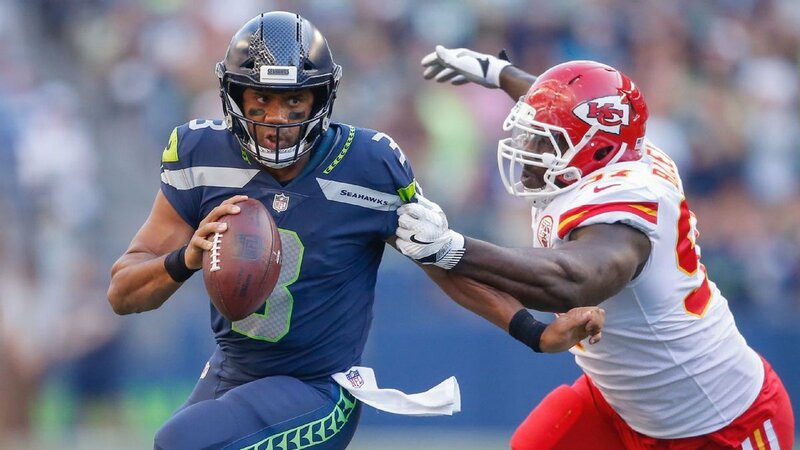 “Kareem got good work last week, and he learned how fast this thing can change where all of a sudden you become that starter and in a position to do that,” Chiefs head coach Andy Reid said after the game (ESPN). Alex Smith didn’t have the best night (7-17 for just 44 yards), but he isn’t going to have anything to worry about from Patrick Mahomes II. Yes, the rookie has looked good, but against serious competition Friday night he was nothing special (8-15 for 70 yards). His best drive stalled at the two-yard line resulting in a field goal when the team needed a touchdown. De’Anthony Thomas has not done much during his career so far. But he showed why he is still in the NFL when he outran the kick Chiefs kick-off coverage for a 95-yard touchdown. Fans are likely hoping the plan is going to be to get Tyreek Hill and Travis Kelce the ball a little more than the Chiefs have been. They had two receptions for 20 yards and were targeted four times each against the Chiefs. If Russell Wilson (13-19 for 200 yards and a touchdown) continues to play as he has been, he will take home the MVP at the end of the season. He makes the throws and he keeps plays alive like no one else can—in short, the man makes magic happen. With a little protection, he is going to decimate secondaries this year. In parts of three preseason games, he is 29 of 41 for 447 yards, three touchdowns and no interceptions (MVP! MVP! MVP!). Seattle’s offensive line looked pretty good. The starting unit gave up one sack, but it was the new guy, Rees Odhiambo, that gave it up. Over all, the unit’s performance was promising against a good Chiefs defense. Chris Carson could be the sleeper of all sleeper picks in fantasy football this season. The team wants Eddie Lacy to succeed, but they can’t deny how well Carson has been playing. Against the Chiefs, he had eight carries for 46 yards and tacked on two receptions for 44 yards. Could he be this year’s C.J. Prosise? If so, what will that mean for the oft-injured Prosise? The shine came off of Trevone Boykin a bit. After a pair of stellar performances, he went 0-6 in very limited time and threw one interception. Kansas City will wrap up its preseason against the Tennessee Titans next Thursday at home (kick off scheduled for 8:30 PM ET). Seattle will wrap their preseason up with a visit from the Oakland Raiders (also next Thursday; kick off scheduled for 10 PM ET).